See all client updates and testimonials on this site by clicking here* and here. * To see all client updates, you need to click “older posts” at the end of the page. 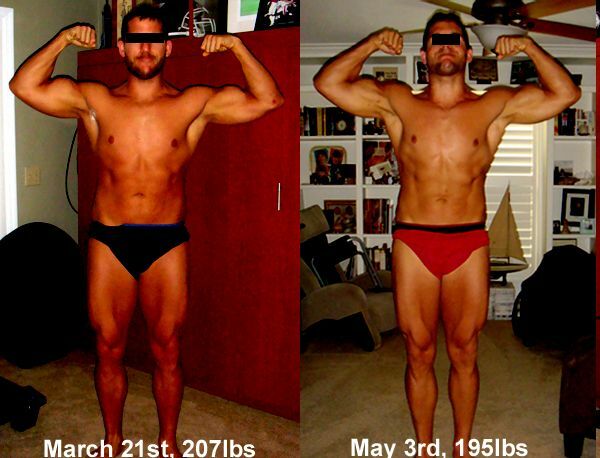 Dave Gerczak, successful entrepreneur and founder of the large online watch store Watchco, has made a complete body transformation. I’ll quote from Dave’s write-up at bodybuilding.com. I found Martin Berkhan on this very thread sometime in February of 2009. I contacted him and started with him officially on March 9, 2009. My weight was 230.8 at that time, having lost 4 pounds while waiting for his routine. I turn 39 in two weeks. 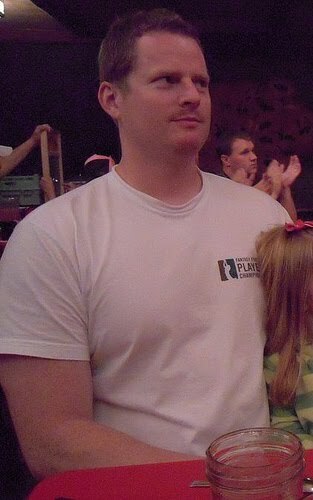 I stopped taking progress pics, as I get really busy with work in November/December, traveled a lot for work in January and was more or less just lazy with pics. However, I kept on LeanGains the whole time, but could have lost the weight faster with less travel, less work and better diet adherence. Oh yeah, it was football season, so I had to drink once a week, right? Either way, I really bore down in March and April, and finished on May 1st. 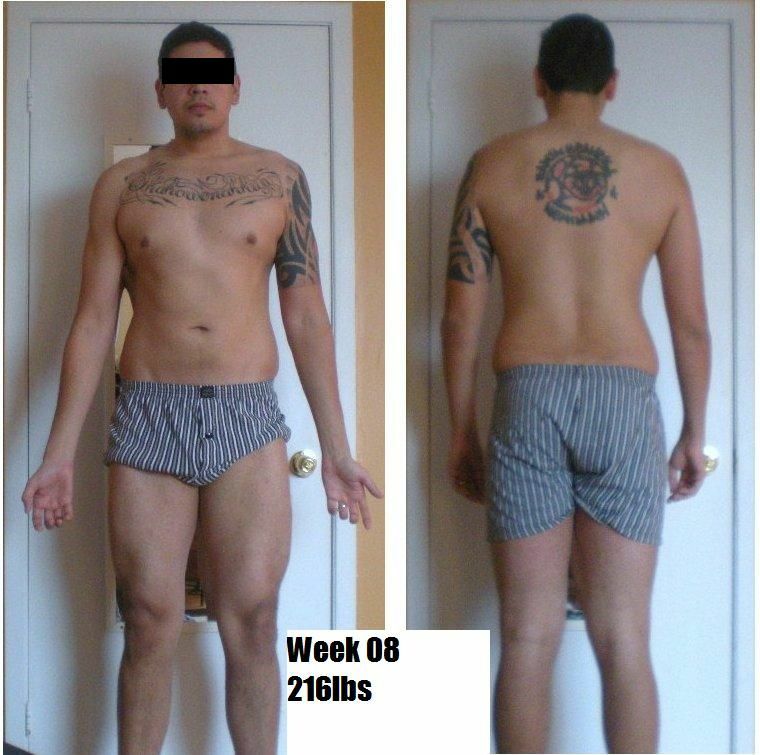 Total weight lost on LeanGains cut, 69.4 lbs in 13 months, 21 days. Bodyfat percentage from 25% to approx 7% (according to Martin). Needless to say, I am a very satisfied client. I love intermittent fasting, love Martin’s program and guidance, and anyone that has doubts can just look at the results. Overall, Dave also managed to gain strength during the diet. His squat increased by approximately 40 lbs and deadlift and chins went through the roof. I should note that these results could have been obtained faster. As Dave got busy with work and travelling there were months that more or less became diet breaks. I think Dave’s close to 6% body fat in these pics, but he has some skin issues obscuring the lower abs which might give the impression that he’s higher. His shredded obliques and serratus tells a different story. Very impressive transformation considering the small loss in scale weight. Jennifer has been doing glute specialization. It has clearly worked and nowadays I call her J-Lo. You might find it hard to believe that Jennifer is 45 years old. I’ve included Jennifers testimonial further down the page. Andreaz achieved his best condition ever for Oslo Grandprix Classic Bodybuilding in April. Despite a grand personal victory, the competition was was stiff with some guys 45 lbs heavier, and being the lightest guy on stage didn’t help. He didn’t make it to the finals this time. 8 week progress shown. Waiting on new pics and will update when they arrive. Strength increases all across the board despite rapid and substantial fat loss. After I helped Gabriel lose enough fat to make him shredded, I put him on a lat specialization routine. It worked very well. 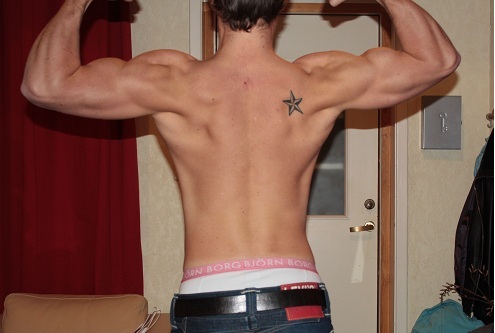 Pics show progress over 12 weeks: significant back and lat development and minimal/no fat gain. Strength gains in some key movements include +40 lbs for weighted chins and bench press. Great example of real bodyrecomposition. More muscle and less fat. 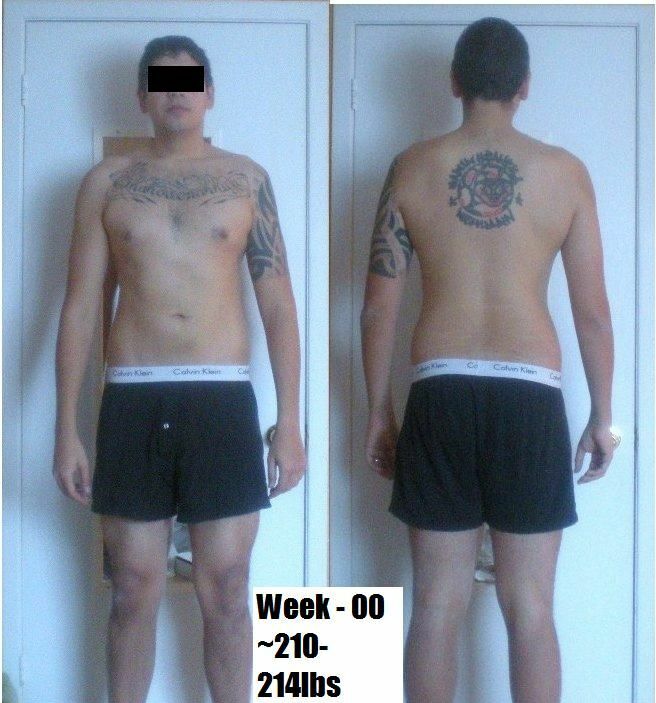 Photo shows progress over 12 weeks (210 lbs/204 lbs). Substantial strength gains across the board: +22 lbs bench press, +65 lbs deadlifts and +35 lbs weighted chins for example. Check out the video Henrik put together to show off his weekly progress. You can read Henrik’s testimonial further down the page. Jim maintained (and even gained a bit) strength perfectly, despite losing almost 10% of his body weight and reaching a shredded 6% body fat. Work in progress but has so far sliced his body fat in half, from 20% to 10%, in about 12 weeks (which included 2 weeks of vacation). Has gained strength in all movements. 8 week progress. Fat loss and strength/muscle gain. Mikael was featured in a client update in May last year. In the time that passed, he has gained lean mass and strength. 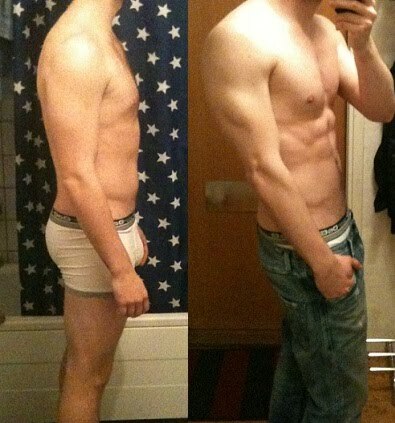 Pictures below show Mikael at the end of his diet last year in comparison to his current condition. Body weight is identical, but body fat is clearly lower. I’d hazard a guess and say that he’s approximately 10% body fat in the older pictures and 7-8% in the latest pictures. This is equal to a lean mass gain of ~4.5 lbs. 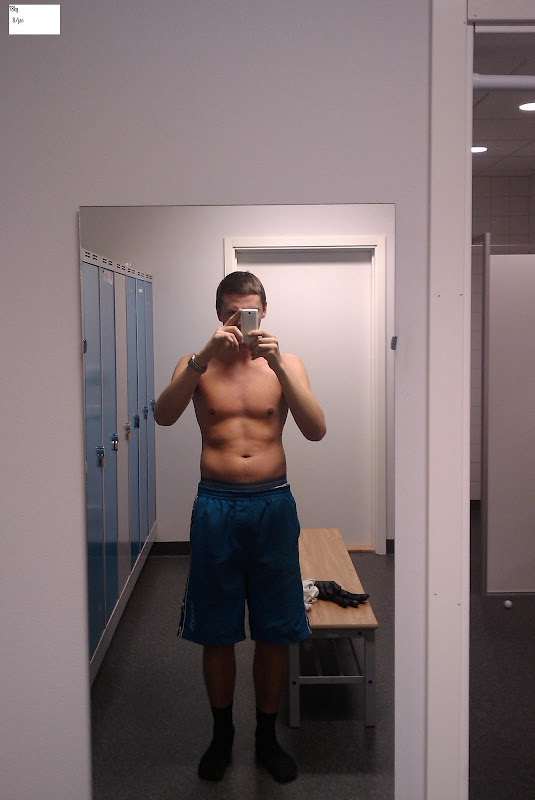 And just for the hell of it, Mikael’s pre-diet pics at 203 lbs from last year. Quite a striking difference in comparison to his current lean condition. Progress over 18 weeks (included several weeks of sickness). Strength increased in most movements. Brad is a work in progress but has so far lost fat and gained muscle and strength. Pictures show progress over 8 weeks. Despite the higher body weight in week 8, he has clearly leaned down. Strength gains include +50 lbs squats and going from 1 chin-up to 5 chin-ups. Olympic weightlifter Jill is a work in progress. Progress over 7 weeks is shown. Despite a minimal loss on scale weight (3.5 lbs), I think the improvements are very clear. Good example of bodyrecomposition. Work in progress. Down 12 lbs in 7 weeks with solid strength gains. Work in progress, but has gained a good deal of strength while dropping 10 lbs in 4 weeks. I have trained most of my life. Sometimes harder than others, but I have been consistent. So at the age of 45 you could say that I have tried lots of methods of training and dieting. As far as diet, my pattern would be to adopt a classic 5-6 meal-a-day, high protein, low carb approach to get lean. But in the back of my mind that way of eating would end and I could go back to a “normal” eating pattern. Yes, I carried the cooler, I made family and friends alter their lives and plans so I wouldn’t miss a meal, I dodged social events, I panicked when I didn’t have my food. Didn’t they understand that I had muscle to preserve? Call it what you will, but it was a roller coaster of putting on and taking off the same 5-10 pounds for the past 20 years. And as I got older, it just got harder, took longer and didn’t look the same when the 5-10 pounds would creep back on. In fact it got downright depressing. I was frustrated and thinking that I should just accept being in my 40’s and carrying around some extra stored energy (FAT). But I don’t like to throw in the towel. I just didn’t know another way to lose fat and I certainly didn’t know how to keep it off. Then I found intermittent fasting. I was truly excited. It’s not that you can’t get lean eating 5-6 times a day, but it is NOT the only way and in fact there are many myths about meal timing. But you can read all you want about a subject, doing it is the proof. Then I found Martin Berkhan and Leangains. His approach includes intermittent fasting but on a daily basis, with an 8 hour eating phase and fasting for 16. There is no one-size-fits-all, but this fit me for sure. I started a program with Martin including training. I loved the program and the lifestyle. I have so much energy, especially during the fasts. I am relaxed and non-stressed about my food which is half the battle to sticking to any program. I was feeling so good about my results with Martin; I decided to tackle a project I had long since given up. My glutes. I wanted a tight, lean and athletic backside. I honestly thought I missed the boat on that one. It just didn’t seem possible to make that kind of transformation in my situation. OK, I will admit, I thought I was too old. But things were going so well I started to think it would be possible. So I asked Martin to design a program to build some nice glutes. He put together a very doable training program, focusing on my preferred body part and of course intermittent fasting. I got what I wanted. I am VERY happy with my results. I still use intermittent fasting and probably always will. It works for me. Thanks Martin. For me, one of the most frustrating things about getting or trying to get in shape is that you always hear different, often opposing, theories and opinions on ‘what works’ and what will give you the best results. You can spend hours and hours of doing research, read theory and listen to ‘gurus’ and still be somewhat in the dark of what diet and workout regimen would give you the results you are looking for. One of the major concerns I had about intermittent fasting when I first heard about it was ‘Will this really work for me?’ I’ve always been an avid breakfast eater and I’ve always woken up hungry and wanting to eat. On top of this, every other source out there says the breakfast is the most important meal of the day, so no wonder I ritualized my breakfast and the whole “Eat breakfast like a king and dinner like a pauper” mentality. So of course I was skeptical about the whole deal with intermittent fasting. How would I, the breakfast king, deal with not eating in the morning? Well, the answer is ‘surprisingly well.’ ‘Surprisingly well’ not only because I thought it would be more of a challenge than it was, but even more surprising that I believe that if I can do it, then everyone else can too. The LeanGains system is neither difficult nor does it requires extra-ordinary will power and motivation – it just gives you the results of such a program. Intermittent fasting is the only ‘diet’ I’ve held on to for more than 6 weeks and trust me, it’s not been because I’ve been lacking the motivation before. What about hunger, metabolism and fatigue in general? Being on a number of cutting diets (or at least trying them out for a while) before, the major pain has always been that I never feel satisfied and full after smallish meals which has lead to the desire to binge or fall of the wagon. With LG, even on a cutting diet I sometimes have trouble getting all my calories in every day! Sure, I do feel somewhat hungry in the morning – but somehow it’s a different kind of hunger and it’s easily ignored and goes away after a short while. When it does go away, I get a surge of energy, motivation and clarity. I know, it sounds illogical. That’s what I thought until I tried it. What were my results? 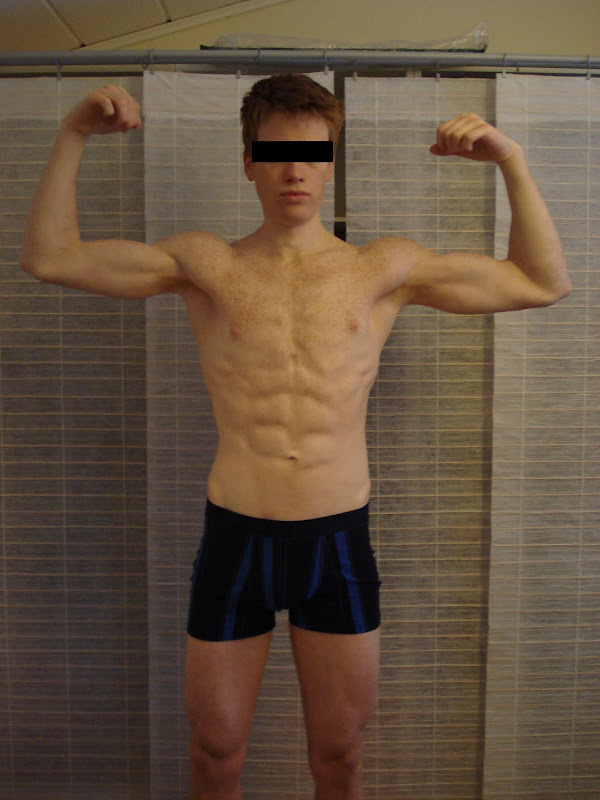 While initially on the LeanGains program just to shed fat, I’ve actually managed the feat of not only losing substantial amounts of fat but also build muscle! I’ve lost about 6 pounds and I’ve added 66 lbs to my deadlift, 22 lbs to my bench press and 33 lbs to my chins (just to name a few exercises) over a 12 week period. I have always been interested in new ways of thinking when it comes to nutrition and training. So when I heard about Martin’s IF and read about it, it just made sense to me and I decided to give it a go. My main goal with contacting Martin was to lean out, and this guy really knows how to get in shape. I work as a personal trainer and a strength coach, and I have always believed that there is no need to reinvent the wheel, only adjust it to the terrain. I therefore got the best one out there to teach me about the IF and set up a diet suited for my goal. The results were great and I lost fat while gaining strength. While I followed the diet a hundred percent during my fat loss period, I now adjust my nutrition from day to day depending on my schedule. What I love about IF is that it’s more of a lifestyle rather than just a diet. I am no longer dependent on eating my 5-6 meals a day, and it’s not the end of the world if I don’t make my ’12 pm meal’ before 2 pm. I have no doubt that this way of eating has its benefits and makes everyday life easier for a lot of people. And it really has for me. 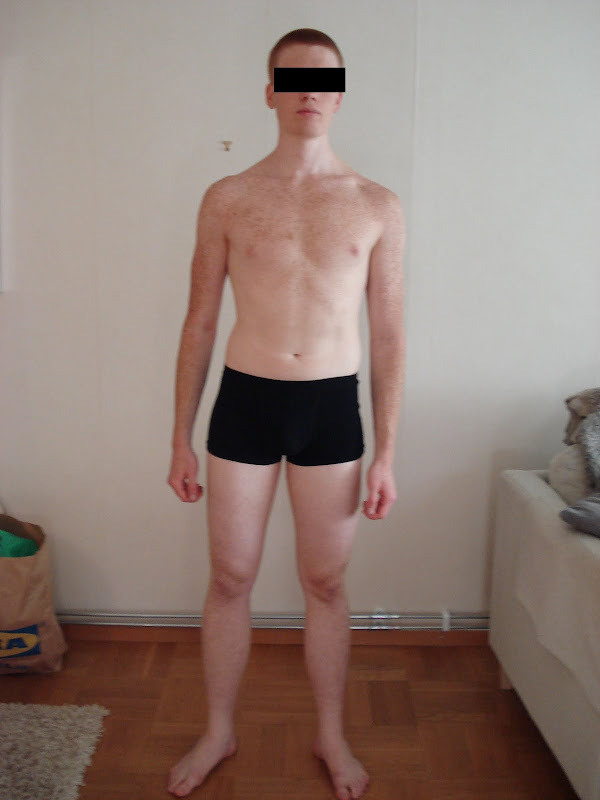 After three years of more or less consistent strength training, I have, through periods of muscle gains and fat loss, tried different types of approaches, low carb, high carb, keto-diets, HIIT, 6-8 meals a day etc. All is self-taught through the internet, and my results have been ok, nothing exceptional. At the end of 2009, me and some friends caught the interest of indoor-rowing on Concept 2 row-ergometers. I saw that my results on 500m was acceptable, and actually quite good compared to results found from C2-competitions here in Norway. Or, good for a lightweight, that is! I was 5 kg overweight. 13th of Feb. 2010, the Norwegian Indoor Rowing Championship was to be arranged. I decided I wanted to give it a go! But to be able to compete in the lightweight-class, I had to drop the excess weight. Out of experience, I knew that during my previous diets, a lot of strength had been lost, so I was affraid that this might ruin my rowing-performance as well. I had followed Martins blog with eager for a couple of years, and therefore decided to contact him on my road to the competition. I was given a thorough description of how to approach the diet, with guidelines for both food intake and strength training. The fact that I work shifts added an extra challenge to the whole, but even this was dealt with in a great way. I was ahead of schedule on my weight loss and actually gaining strength in several movements! This allowed me to do a slow carb-up before the contest, instead of a high intake just before the race. I weighed in at 74,6 kg, full of energy! The contest preparation was excellent, and the final result as well, gold winner in the lightweight-class, 500m! Whether your goal is some sort of competition or just personal goals in sports or weight loss/strength gain, I will not hesitate to recommend Martin Berkhan as coach!